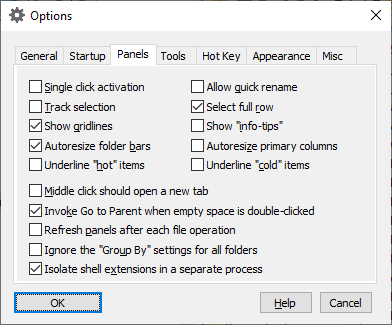 If checked, this option causes AB Commander to navigate to a folder or open a file after you click on it in one of the panels. If this option is not checked, you must double-click on an item (or press Enter) to open it. This option is available only if the operating system provides support for it. If checked, this option causes AB Commander to let you rename a file or a folder after you click on it or press F2. If this option is not checked, you must use the Rename command on the Command menu to rename files or folders. If checked, this option causes AB Commander to select a file or folder in the panel whenever you keep the mouse pointer over the item longer than one second. If this option is not checked, you must click on an item (or use the arrow keys) to select it. This option is available only if the operating system provides support for it. If checked, this option causes AB Commander to display the full row of a selected file or folder using a distinct color. If this option is not checked, only the name of the selected file or folder is shown in the distinct color. This option is available only if the operating system provides support for it. If checked, this option causes AB Commander to display the gridlines separating the rows and columns within the panels. This option is available only if the operating system provides support for it. If checked, this option causes AB Commander to display the info-tips for the partially visible items. This option is available only if the operating system provides support for it. If checked, this option causes AB Commander to automatically resize the width of the folder bars to maintain it in proportion to the full width of the panel. If this option is cleared, the widths of the folder bars will not be automatically adjusted. If checked, this option causes AB Commander to automatically resize the width of the first column in each file panel to expand or contract when the panel itself is expanded or contracted. If checked, this option causes AB Commander to underline the items as you move mouse over them. This option is available only if the operating system provides support for it. Also, the Single click activation option (see above) must be checked as well in order for this option to take effect. If checked, this option causes AB Commander to underline all the items that can be open by clicking them with the mouse, no matter where the mouse pointer currently is. This option is available only if the operating system provides support for it. Also, the Single click activation option (see above) must be checked as well in order for this option to take effect. If checked, AB Commander will invoke the Go to Parent command when you double-click on empty space within its panel. If this option is cleared, then double clicking on an empty space will have no effect. Normally, the information in the panels is updated automatically as the changes to the files occur. If, however, the automatic updates are not happening for some reason, and you find yourself pressing the F5 key too often, you can check this option and AB Commander will update the information displayed in its panels after each file operation (such as Copy, Move, Rename, etc.) for you. If checked, AB Commander will automatically change the orientaion of the panels between the vertical and horizonal split, depending on the orientation of the screen of your device.